Medical Oncology Department, Poitiers, France. Submitted February 10, 2005; accepted March 18, 2005. From the Department of Medical Oncology, Georges Pompidou European Hospital; Urology Department Cochin Hospital, Paris; and Medical Oncology Department, Poitiers, France. Submitted February 10, 2005; accepted March 18, 2005. Onycholysis and skin toxicity occur in approximately 30% of patients treated with docetaxel. We investigated the efficacy and safety of (84400 APT Cedex, Akromed, France) frozen glove (FG) for the prevention of docetaxel-induced onycholysis and skin toxicity. Patients receiving docetaxel 75 mg/m2 alone or in combination chemotherapy were eligible for this case-control study. Each patient wore an FG for a total of 90 minutes on the right hand. The left hand was not protected and acted as the control. Onycholysis and skin toxicity were assessed at each cycle by National Cancer Institute Common Toxicity Criteria and documented by photography. Wilcoxon matched-pairs rank test was used. Between August 2002 and September 2003, 45 patients were evaluated. Onycholysis and skin toxicity were significantly lower in the FG-protected hand compared with the control hand (P= .0001). Onycholysis was grade (G) 0 in 89% v49% and G1 to 2 in 11 % v51 % for the FG-protected hand and the control hand, respectively. Skin toxicity was GO in 73% v41 % and G1 to 2 in 27% v 59% for the FG-protected and the control hand, respectively. Median time to nail and skin toxicity occurrence was not significantly different between the FG-protected and the control hand, respectively (106 v 58 days for nail toxicity; 57 v 58 days for skin toxicity). Five patients (11 %) experienced discomfort due to cold intolerance. FG significantly reduces the nail and skin toxicity associated with docetaxel and provides a new tool in supportive care management to improve a patient’s quality of life. J Clin Oncol 23:4424-4429. © 2005 by American Society of Clinical Oncology. Docetaxel and paclitaxel are part of the taxane group, which has emerged as one of the most powerful classes of chemotherapeutic agents and exhibits a wide range of activity against a variety of solid tumors. 1-4 Taxanes act by disrupting the normal microtubule network essential for mitotic and interphase cellular functions.5 In general, the toxicity profile of each taxane is predictable and can be managed with prophylactic measures and supportive care.6 Cutaneous toxicity manifested as erythema and desquamation of the skin of the extremities (hand-foot syndrome [HFS] ) and nail changes have been reported with taxane treatment, but both toxicities have been associated more frequently with docetaxel.7-9 Although HFS does not appear to be a common adverse event with docetaxel treatment,7 a recent review of published studies by Minisini et al8 showed that the overall incidence of taxane-induced nail changes is as high as 44%. Nail changes include hyperpigmentation, splinter hemorrhage, subungual hematoma, subungual hyperkeratosis, orange discoloration, Beau-Reil lines (indicating the cessation of nail growth), acute paronychia, and onycholysis (the loosening or separation of a fingernail or toenail from its nail bed). Usually, several or all nails are involved. Some nail changes are asymptomatic and cause only cosmetic problems, whereas others can be accompanied by either discomfort or pain, and negatively affect a patient’s ability to perform manual activities and ambulate. Nail changes are usually transitory and disappear with drug withdrawal, but may persist in some patients.10 Application of local topical antibiotics or antifungal treatments may be required to treat nail bed infections, which seem to be a complication of nail’s detachment. Onycholysis is manifested in 2% to 3% of patients.11 The brown discoloration associated with nail toxicity is indicative of bleeding beneath the nails. Dermatologic examination may show no evidence that an infection was the origin of the nail change.12 The type of nail change is related to the number of chemotherapy cycles administered, and to date no effective preventive measures are available.13. Docetaxel-induced HFS presents as a discoloration of the skin that progresses to blisters and desquamation, and may be accompanied by nail changes that progress to onycholysis.7 The hands are usually more frequently affected than the feet. The cause of HFS is also unknown, but it appears to be a direct cytotoxic effect on keratinocytes associated with peak drug concentrations and cumulative doses.7,9. Although nail and skin toxicity are not life threatening, they should be managed effectively to prevent early discontinuation of chemotherapy; the toxicities often do not. Resolve between cycles. 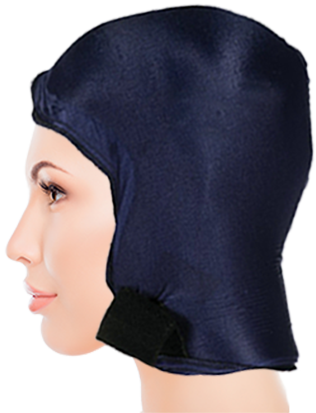 Cold temperature applied to the scalp before, during, and after chemotherapy reduces the incidence of chemotherapy-induced alopecia.18-20 This effect is related to a cold-induced vasoconstriction, which reduces the amount of drug reaching the hair follicles, and causes a decrease in follicular metabolism. In addition, oral cryotherapy has been administered with efficacy in patients receiving bolus-dose fluorouracil therapy.21 This concept was extended to the present study of a frozen glove (FG) for the prevention of nail and skin toxicity associated with docetaxel treatment. The primary end point was efficacy in onycholysis prevention, and secondary end points were the assessment of efficacy in the prevention of skin toxicity, the median time to occurrence of nail and skin toxicity, and patient comfort. In this phase II, multi-center, matched case-control study, we evaluated the applicability and efficacy of FG therapy in the prevention ofdocetaxel-induced onycholysis and skin toxicity during a 14-month period extending from 2002 to 2003. Each patient wore the protective glove on the right hand and had no protection. Fig 2. Nail toxicity grade 2 (onycholysis) present on the left hand (control) but absent on the protected right hand. on the left hand, which was considered to be the control side. By this method, we could obtain a comparative incidence of nail and skin disorders with and without cold protection. Patients enrolled onto this study were undergoing treatment for a variety of tunum types with docetaxel 75 mg/m2 as a 1-hour intravenous infusion every 3 weeks either alone or in combination with other cytotoxic agents. Inclusion criteria included no prior treatment with taxanes, the absence of skin and nail disorders at the start of treatment, a life expectancy of at least 3 months, and an Eastern Cooperative Oncology Group performance status of 0 to 2. Patients were excluded if they had Raynaud’s phenomenon, distal metastases, Original pathology, arteriopathy, cold intolerance, or peripheral neuropathy grade 2 or higher. All patients provided written informed consent. 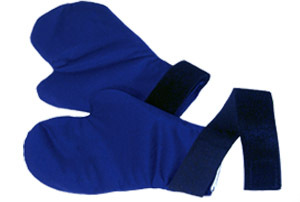 Patients wore (84400 APT Cedex, Akromed, France) flexible glove (Fig 1). 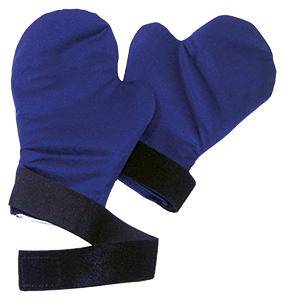 This patented glove contains glycerin, which has thermal properties, allowing its use in hot or cold therapies. The gel-filled glove covers the hand to the wrist and separates the thumb from the rest of the hand. 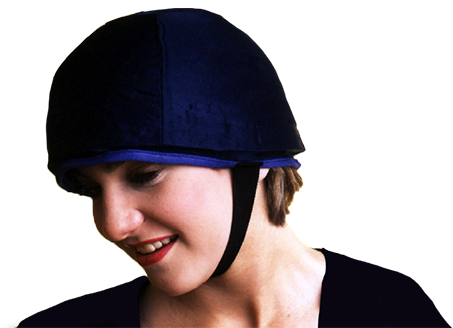 Before use, it must be refrigerated for at least 3 hours at -25 to -30°C. With every docetaxel infusion, each patient wore an FG for a total of 90 minutes on the right hand (15 minutes before the administration of docetaxel, during the 1-hour docetaxel infusion, and 15 minutes after the end of infusion). Because of the duration of the infusion, two FG’s were used successively (for 45 minutes each) to maintain a consistently low temperature of the hand. The left hand was not protected by the FG and acted as the control. Onycholysis and skin toxicity were assessed at each cycle by the medical investigator (F.S. or E.L. in Paris and J.M.T. in the Poitiers centers) and assessment was repeated by a second different observer, using National Cancer Institute Common Toxicity Criteria (Version 2); that is, grade 1, indicated by discoloration, ridging (koilonychia), or pitting; and grade 2, indicated by partial or complete onycholysis or pain in the nail bed. Changes were photographically documented by the medical investigator. Patients’ comfort level was assessed using a 4-point rating system that determined whether patients were dissatisfied (0), not very satisfied (1), satisfied (2), or very satisfied (3). The results were expressed as two patient groups: those satisfied with the FG (2 and 3) and those dissatisfied with the FG (0 and I). Treatment was stopped when patients showed intolerance to the FG, had a serious adverse event, or withdrew consent. Analyses of toxicity were carried out on the intent-to-treat population. The Wilcoxon matched-pairs rank test was used to determine the magnitude of difference between the control hands and the FG-protected hands. The Kaplan-Meier and log-rank methods were used to estimate and compare differences in time to toxicity occurrence. Forty-five patients (10 women, 35 men; median age of 65 years) undergoing treatment for lung, breast, prostate, Fig 3. Nail toxicity grade 1 (dyschromia), showing the difference between the left hand (control) and the protected right hand. and other cancers were enrolled onto the study (Table 1). Docetaxel was administered either as monotherapy (71%) or in combination with other cytotoxic drugs (29(%), such as carboplatin, vinorelbine, and anthracyclines. This was first-line chemotherapy for 76% of patients. The median number of docetaxel cycles administered was six (range, one to nine cycles) and the median cumulative docetaxel dose was 810 mg (range, 150 to 1,275 mg; Table 1). Forty-five patients who received docetaxel chemotherapy in combination with FG treatment were evaluated for nail toxicity. The application of FG significantly reduced the overall occurrence of nail toxicity from 51% to 11% (P = .0001), with grade 2 nail toxicity (onycholysis) occurring in none of the FG-protected hands compared with 22% of the control hands (Fig 2). Grade 1 toxicity (dyschromia; Fig 3) was observed in 11% of the FG-protected hands and in 29%, of the control hands (Table 2). Forty-one patients receiving docetaxel chemotherapy in combination with FG treatment were assessed for skin toxicity; the remaining four patients presented with incomplete data. Overall, skin toxicity occurred in 24% of the FG-protected hands versus 53% of the control hands (P = .0001; Table 3). Although the appearance of nail toxicity was delayed with FG protection, no difference was observed in the median time to appearance of skin toxicity (Table 4). Assessment of patients’ global comfort included factors such as glove contact, temperature tolerance, and immobilization constraints. Forty-three patients were assessable (two patients refused FG protection). Using the ad-hoc rating scale, 37 patients (86%) were satisfied with the treatment, whereas six were dissatisfied, including five (11%) who withdrew from the study because of cold intolerance during glove contact (Table 5). Chemotherapy-induced toxicity adversely affects patients’ quality of life and limits the dose of chemotherapy that can be administered. The dermatologic complications of cancer chemotherapy can result in significant morbidity, cosmetic disfigurement, and psychological distress. In this study, the use of an FG reduced the incidence of nail and skin toxicity associated with docetaxel 75 Mg/m2 administered every 3 weeks, either alone or in combination with other cytotoxic agents. Eleven percent of the FG-protected hands developed nail toxicity with dyschromia, but no onycholysis; this result compared favorably with the unprotected hands, 29% of which developed dyschromia (grade 1) and 22% of which developed onycholysis (grade 2). The FG delayed the median time to occurrence of nail toxicity (106 days) compared with non-FG-protected hands (58 days). Similarly, the incidence of skin toxicity of the FG-protected hand was reduced by half. The incidence of nail changes observed in the unprotected hands in this study are consistent with those reported for docetaxel.8,11-13,22 Although taxane-induced nail toxicity has been observed in patients using the regimen administered weekly and every 3 weeks,8 the risk of developing nail reactions may be related more to the dosing interval and the cumulative dose than to the dose administered.7-9 The temperature of the FG in this study (-25 to -30°C) was in the same range as that used in a study of the cold cap to prevent docetaxel-induced alopecia,19 in which 86% of patients presented with no worse than grade 2 alopecia, and had no need to wear a wig. In this study, the simple FG technique reduced the incidence of nail and cutaneous toxicity. The FG is easy to apply, is well accepted by most patients, and has no major adverse effects. Thus, it may be considered a new tool in supportive care and may be recommended for routine use with chemotherapy agents. These favorable results warrant additional studies to assess the efficacy of FG protection with other doses or schedules of docetaxel, either alone or in combination, and with other chemotherapeutic agents, such as free or liposomal doxorubicin.7-9,23 Future applications can also include the feet. 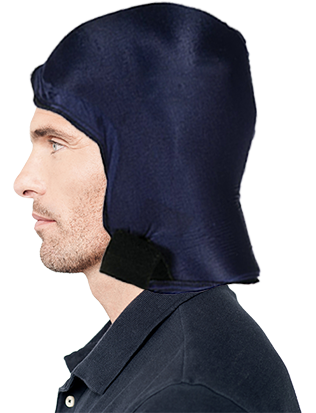 A logical development of our study is the administration of three-fold therapy using a cold cap, gloves, and socks in a blinded manner for the investigator, and random hand and foot allocation. In August 2004, the US Food and Drug Administration approved docetaxel for use in combination with doxorubicin and cyclophosphamide for the adjuvant treatment of patients with operable, node-positive breast cancer,24 and in May 2004, approval was obtained for the use of docetaxel in combination with prednisone as a treatment for men with hormone-refractory metastatic prostate cancer.25 In addition, docetaxel is being studied extensively in clinical trials for safety and efficacy in head and neck and gastric cancers. A new era is beginning in the field of interventional measures. Such measures might be capable of preserving the duality of life for thousand of patients. We thank the men and women who entered onto this study. We also thank Sarah Guyon for her valuable work. AUTHOR’S DISCLOSURE OF POTENTIAL CONFLICTS OF INTEREST: The authors indicated no potential conflicts of interest.